(5 Customer Reviews) | Write Review 6 issues per year Arthritis Digest magazine summarises the latest research in the arthritis arena making it essential reading for anyone affected by the painful condition. Arthritis Digest magazine informs readers and encourages them to learn, try new ideas and explore their options. You’ll know what your doctor is talking about, what options are available to you and what’s around the corner in terms of new treatments. Take control of your arthritis – with Arthritis Digest. Welcome to the Summer issue of Arthritis Digest, here to provide you with a digest of all the latest health news about arthritis. We’re delighted to report that a number of leading stakeholders in the arthritis arena have taken the time to discuss our magazine – and the feedback is extremely positive. More on this to follow! In addition to our round-up of news, the Meet the Team series continues with a physiotherapist and occupational therapist… turn to p22 to learn what they can do for you. 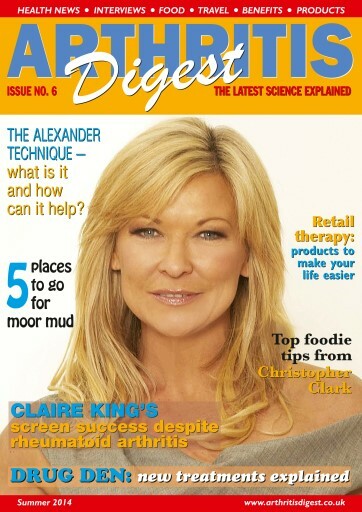 The Alexander technique is placed under the spotlight and actress Claire King discusses her personal journey after being diagnosed with rheumatoid arthritis in her thirties. There’s also a fabulous feature on moor mud hydrotherapy and wraps – a great excuse for a dirty weekend. Enjoy the issue! Arthritis Digest magazine summarises the latest research in the arthritis arena making it essential reading for anyone affected by the painful condition. You'll receive 6 issues during a 1 year Arthritis Digest magazine subscription. Interesting and very informative. A must read for all Arthritis sufferers. Brilliant magazine, packed full of up to date research, advice and tips on managing Arthritis! Also some great competitions to enter. Very interesting, up to date articles; relevant product information and great interviews!! A must read for anyone suffering from Arthritis. This is the best resource I've found about arthritis and similar conditions including fibromyalgia, lupus and Sjogren's syndrome. Clear, easy to understand information/reviews - covers rheumatoid arthritis and osteoarthritis. Definitely recommend. You'll receive 6 issues during a 1 year Arthritis Digest magazine print subscription.